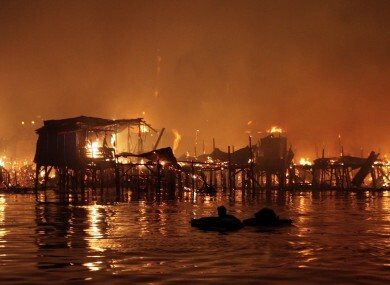 A man floats in the water as his neighbourhood - houses on stilts on the edge of a bay - went up in flames in Manila, the Philippines capital. The Government has been accused of designing the supposedly impartial referendum guide – currently being distributed to homes – to play down the possible negative effects of the Fiscal Treaty. Enda Kenny has insisted that the date of the referendum vote will not be changed from May 31, facing down calls to the contrary from independent TD Shane Ross. And today was your last opportunity to post your voter registration – so if you haven’t done it by now, you’ll have to visit a council office in person. Five children have died in a house fire in England, aged between five and 10. A woman has been arrested in the wake of the blaze. The estate agent selling Charles Haughey’s former mansion has apologised after claiming that Colonel Gaddafi and Margaret Thatcher had been entertained at the country pile. Haughey’s family have denied that either leader ever visited. A school in New Zealand has banned hugging. Apache Pizza have defended their decision not to make deliveries to the Moyross estate in Limerick, saying it is too dangerous. A woman has been killed after the car she was travelling in collided with a truck in Cork. A nine-year-old girl also in the car escaped uninjured. A study commissioned by the EPA has found that ‘fracking’ for natural gas carries potential risks to water supplies, and may increase the chance of tremors or earthquakes. Former Sun and News of the World editor Rebekah Brooks taught David Cameron text-speak. You’ve probably seen the controversial Time magazine breastfeeding cover – and we’ve been rounding up what the world thought of it. Dublin singer-songwriter Ryan O’Shaughnessy has claimed a place in the live finals of Britain’s Got Talent less than a week after being told he had got the boot.